Peer Support Key To Helping Veterans Overcome Mental Health ProblemsShare on facebookShareShare on twitterTweet Share on emailE-mail0 CommentsShare on printPrintBy Andy Marso This is the second installment of a three-part series on veterans’ health. The first part, which you can find here, deals with the military medical system. The third part, which you can find here, deals with environmental exposures. Sitting in a Junction City, Kan., coffee shop with his laptop and a pile of textbooks splayed on a table, Will Stucker looks like any other college student, if a bit older than most. But Stucker, 38, has taken a different path to college than most of his classmates at Emporia State University. His path took him to South Korea and Kuwait, then to a tank rolling toward Baghdad, then to an armored Humvee on the streets of a small town in Iraq where insurgents repeatedly tried to kill him — and two of them almost succeeded. Then, finally, to a Department of Veterans Affairs hospital in Topeka, where counselors helped him work through the post-traumatic stress disorder (PTSD) he came home with. Stucker is working toward a master’s degree in clinical psychology so that he can help other veterans overcome PTSD. About one-third of the 2.6 million veterans returning from Iraq and Afghanistan have been diagnosed with mental illnesses like PTSD, anxiety and depression. The VA Eastern Kansas Health Care System which includes the Topeka hospital where Stucker was treated, is seeing more patients for PTSD every year: up from 1,297 in 2011 to 2,216 in 2014. The costs of PTSD treatment there this year exceeded $28 million. Stucker praises the specialized mental health unit at Topeka’s Colmery-O’Neil VA Medical Center, but not all veterans have easy access to that kind of facility, and there is widespread agreement that the VA system nationwide needs more psychiatrists and more innovative outpatient therapies. Veterans also seem to agree that one of the things that can most benefit them is talking with other veterans. 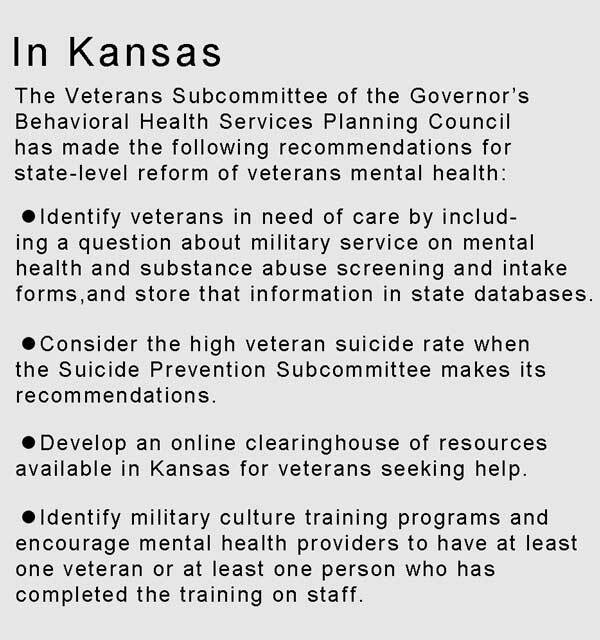 A VA mental health reform bill aimed at filling some of those gaps passed the U.S. House unanimously but has been blocked in the Senate by Tom Coburn, a Republican from Oklahoma. The Clay Hunt SAV Act, named for a Marine who committed suicide in 2011, would create a peer support and community outreach pilot program and an interactive website to help veterans find those resources in their area. It also would offer student loan repayment to psychiatrists who choose to work at the VA and require annual evaluations of suicide prevention programs within the VA and the U.S. Department of Defense to determine their effectiveness. Coburn, a retired physician who has earned the nickname “Dr. No” for his stances against federal spending, reportedly balked at the bill’s $22 million price tag. Coburn is slated to leave the Senate at the end of the year, and the bill’s supporters say they will bring it back next year when he is gone. But Iraq and Afghanistan Veterans of America criticized the senator in a recent release that called the delay deadly, given that an average of 22 veterans take their lives each day. Stucker, 38, had more military preparation and experience than many of those he served with in Iraq. By the spring of 2003, Stucker was back in Kuwait, but this time gearing up for an invasion of Iraq. A tank commander, he was part of the “tip of the spear” that drove straight into Baghdad with little trouble. He and his colleagues later found out many Iraqi soldiers had smuggled themselves out of Baghdad in garbage trucks. Stucker was deployed for a year while a country in chaos tried to find its footing with its former leaders deposed, scattered and on the run. He returned to Fort Riley in February 2004, but within a month his unit had orders to head back to Iraq. According to the National Council on Disability, soldiers should get twice the time at home between deployments as the time they spend deployed to minimize PTSD. In Stucker’s case, that would have been two years. “We had eight months,” he said. When his unit returned to Iraq, things had changed. It was still chaotic, but now the U.S. military’s role was to occupy and police, rather than facilitate the overthrow of Saddam Hussein. Stucker’s years of tank commander training were set aside. “We drove our tanks to our FOB (forward operating base) and then parked them and didn’t touch them again,” he said. He became a tank commander in a Humvee, leading patrols in Yusufiya, about 20 miles south of Baghdad. Stucker said they were generally “presence patrols,” similar to cops on the beat. Stucker became intimately acquainted with the insurgents’ main weapon: the improvised explosive device (IED). Sometimes insurgents would kill donkeys or camels, hide explosives in the bodies and set them on the street to blend in with other roadkill. Other times they used human bodies. He once saw a couple of heavily armored Bradley Fighting Vehicles blown up by mortar rounds buried in the road. Stucker survived several IED blasts in his armored Humvee, but every patrol brought the possibility of death. While he was on patrol in May 2005, two men in a car with a trunk full of explosives pulled into the road in front of his 5-ton Humvee. The car did not explode, but Stucker’s Humvee flipped as it drove over the vehicle. Stucker broke three vertebrae in the crash and still suffers chronic back pain. The injuries he suffered in the crash ended the war for Stucker. But his fight to reintegrate into civilian life was about to begin. Stucker’s father and grandfather both served in the Army, but he said he found it hard to talk with them about his deployment. “I did a little bit, but I was in a bad place when I got out,” he said. He said the PTSD treatment at Colmery-O’Neil was very helpful, even though demand for the services sometimes meant he had to make appointments with his doctor weeks in advance. When he felt like he was in crisis and needed to come to the hospital on an emergency basis, he could. “I’ve had to do that a couple times, and they’ve always been very professional, very nice to me,” Stucker said. He’s not sure the general public understands the scope of the mental health crisis confronting the embattled VA health care system. Other veterans, like Webster of Topeka, seek treatment outside the VA system. Webster said he found his best treatment option at the Elk Institute, a Florida-based nonprofit run by psychotherapist Carrie Elk, who provides free services to military veterans. Webster said it’s important for the VA staff to “look outside their system” and partner with carefully vetted organizations like Jarboe’s. Jarboe said the Military Veteran Project has helped a Marine veteran who locked himself in his house for 10 months because that was the only place he felt safe and others who have instinctively tried to strangle their wives when awakened. “We train these guys and gals to go to war, but we don’t train them how to come home and rehabilitate and reintegrate into society,” she said. Jarboe said she believes PTSD is the result not only of what veterans have seen in combat but also the stress their bodies endure. The combination takes time and patience to overcome. Things like lights, noises, crowds and fast movements can be triggers for reactions that even friends and family members might not understand. Stucker still goes to the VA regularly and has come a long way in the decompression process. He’s married and completed a bachelor’s degree in family studies at Manhattan Christian College. He considered attending Kansas State University, but thought the private school just south of campus with an enrollment of less than 400 students would be a better fit. There’s only one thing that still bothers him about his military service: the way it ended. Though he was deemed too disabled to return to the fight, he was denied medical retirement because he was not disabled enough to qualify given his years of service. He said Army policies have since been changed to give medical retirement to anyone injured even in their first enlistment, but a military benefits counselor told him he was one of thousands who “fell through the cracks” early in the Iraq and Afghanistan conflicts, when the U.S. Department of Defense was not prepared to process the large numbers of wounded soldiers. Stucker said he has contacted people in the military, the VA and Congress about the issue but has only been routed elsewhere. Meanwhile, he will keep working toward his clinical psychology degree, so he can help show other combat veterans the path to recovery.